The ceramic candle is imported directly from the USA, passed over 12 hours of high temperature baking process in over 1150 C. The ceramic candle is 100% natural based, does not contain any chemicals. The first ceramic filter was introduced in 1827 by Doulton from England and was designed to reduce the cholera from spreading. Extend about 1-2 years (depends on water quality and usage volume). Ceramic candle can be re-used by cleaning with sponges as long ceramic doesn’t crack off. With only 0.2 micron, is able to block anything larger than water molecules such as virus, germs and bacteria. 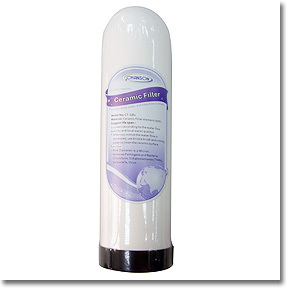 Only water and smaller contaminants can pass through this filtering system. It is great absorber of pesticides, odor, chlorine, chemicals as well.